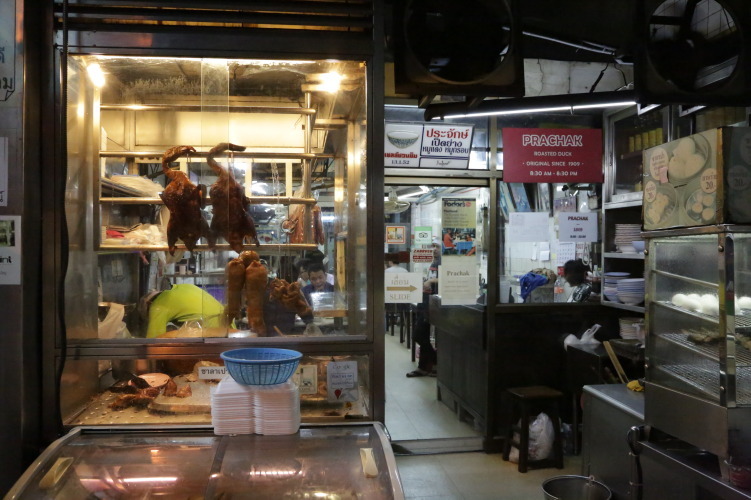 Charoen Krung Road near Robinson shopping center in Bang Rak has quite a few vendors for duck. Prachak Pet Yang is a favorite by many in the area. From the newspaper and magazine reviews plastered on the wall, I’m not the only one that enjoys my visit here. Established in 1909 means a reputation to protect. If you’re curious on what the duck looks like, the roasted and gleaming red birds are hanging in the front window next to the entrance. When you’ve done the same thing for more than 100 years you’ve had plenty of time to get the food right. And the roasted duck on rice (khao naa ped) is very good, tender and flavorful. What you get is a fusion of Thai and Chinese flavors. The ducks are stuffed with fresh Thai herbs, such as galangal, lemongrass, kaffir lime leaves and then marinated in more Chinese or Cantonese flavors (garlic, ginger etc.) before slow-roasted in wood coal from the mangrove threes until the skin hast a deep mahogany like color. When you put that first bite in your mouth you know what a succulent and tender duck tastes like. The roasted duck over rice (khao naa pet) doesn’t need any seasoning. It’s juicy, the rice is dry and the dark spiced soy sauce is neither too thick or too sweet. It has a nice hint of lemongrass and ginger from the marinade. The duck skin is slightly crispy and melts in your mouth. Also the ba mee (egg noodles) version with roasted duck has a nice texture and comes with a super-fresh egg. They have a broad list of other dishes as well. Pork wonton, shrimp wonton, egg noodles with pork, fried rice with crab, Chinese infused sausage geez, fried egg noodles with Chinese gravy (goi see mi) and dim sum are some alternatives. The shrimp wonton comes with big chunks of shrimp stuffed inside a light dough. They are decent plates and bowl, but definitively not in the same leauge as the duck. But don’t get me wrong, if I came with a group, I wouldn’t hesitate to order a couple of the other dishes as well for sharing. But the duck is what shines and what you and most others come here for. The duck is what they have the Shell Shuan Shim award for, not the other dishes. Another duck specialist in the same area is Charoen Wiang Pochana. 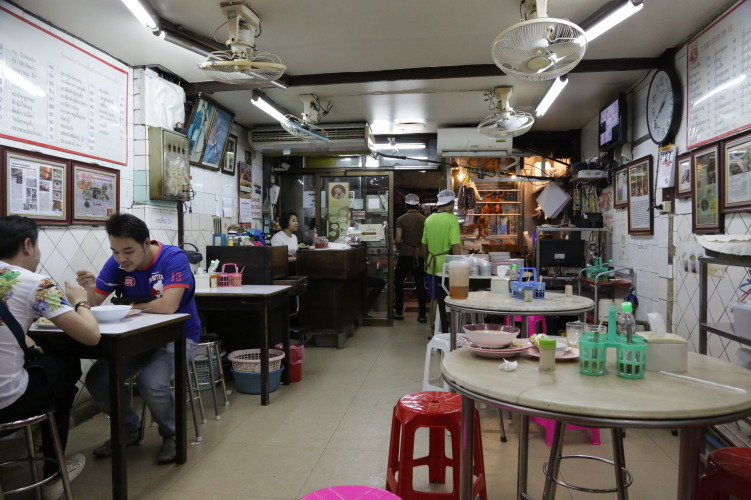 It’s a popular family-run place with locals and you will see people come and go all the time, including all the locals coming for take away. 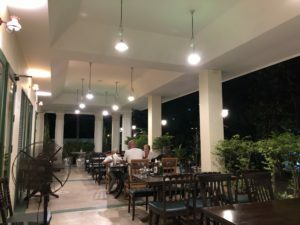 It can be quite busy during regular lunch and dinner hours, and you just have to get used to the waiters shouting out orders. viagra buy now Food: Best for duck. Also other dishes. Chinese food with a Thai touch, like pork wonton, shrimp wonton, eggnoodle with variations of pork or duck, dim sum etc. Open: 8am – 8.30pm. Al a carte dishes from 10am. How to get there: Take the BTS to Saphan Taksin. Turn left on Charoen Krung towards Silom Road. Pass Robinson to your left and continue for a minute until you are between Soi 44 and 46, then cross over to the other side of the street. Prachak Pet Yang is a favorite by many in the area. Established in 1909 means a reputation to protect. If you're curious on what the duck looks like, the roasted and gleaming red birds are hanging in the front window next to the entrance. See full review at StreetsideBangkok.